More friends and a blog: Another weekend gone? Well we woke up Saturday morning feeling kind of tired, and since we had something to go to in the evening we decided to put off our day of canoeing until Sunday. It's never fun to be out in nature when you have to be home at a set time for an evening out. 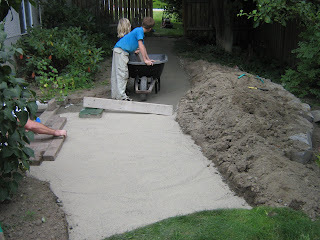 Now I know that most people, when they are already tired might choose to spend the day relaxing in the yard, maybe puttering in the garden, playing ball with the kids or maybe going for a nice walk with the dog. ( or even say, getting to knit!!!) What did we do? 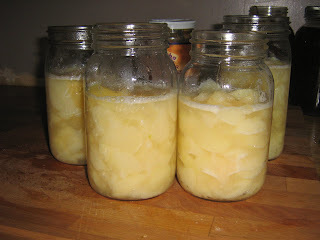 Cooked and froze pears from my neighbour. 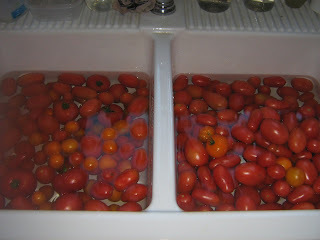 Made the tomatoes on the left into more stewed tomatoes, ones on the right into more salsa. Roasted tomatoes. I use them to make a sort of concentrated soup base which I freeze. The flavour of the roasted tomatoes is so intense that it is delicious served in many different ways. 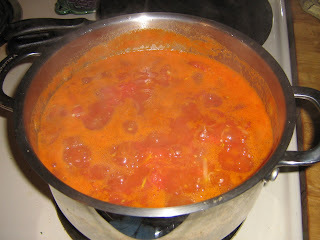 I used a little of it for the Mexican style soup shown below. 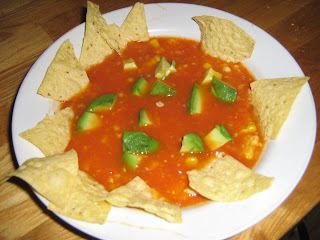 I just use some of the base, add broth, corn and garlic, then serve with avocado and tortilla chips. I like it even more with home-made garlic croutons but by that time I couldn't be arsed to do even one more thing. Well maybe just one more thing...eat my fair share of pie. This is one of my favourite pies. It has ground walnuts on top of the crust under the plums and then it is topped with custard and baked. It is so good! We will be eating a lot of them over the next few weeks while our plums are ready. While I was doing that. The guys were doing this. 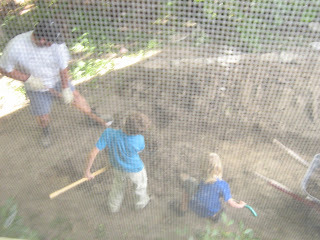 Quite a bit of digging. A whole lot of shovelling fill off the truck into the wheelbarrows (my least favourite job). Some levelling and some brick laying. Most of this was done by S and the boys while I did the food preservation. Although I was the lucky one who got to do all the shovelling from truck to barrow and any other grunt work that needed to be done. W wants it known that he had to lift a lot of brick. I am looking forward to getting a chance to put plants in that new bed though. All in all a good day's work, although maybe not the way a normal person would choose to spend a day on which they were already tired...but I never said we were normal. No, not a bit. And this is how it looked just before dusk last night. And this...this is Clipper, Clipper is not happy. We had promised to take her out for a dip, but Sunday turned out to be windy. 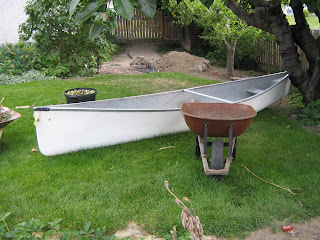 If there is one thing that I am not fond of it is being in a little, bitty boat on a wavy, choppy lake with one large man and two small children. Not my idea of a good time. Poor Clipper. But I am happy because look what I got. 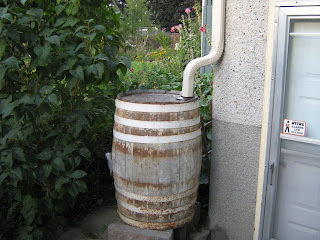 Finally, finally, about two years after picking up this barrel that was marked free on the road side, I got me a rain barrel all hooked up to new downspout. 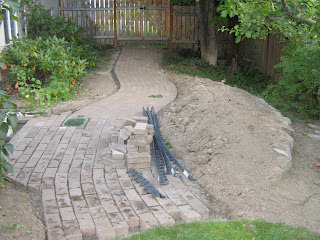 *I should mention that the reason this post has a frugality label is because we got all the bricks for this project for free (from a retail nursery close-out). Gosh, I was tired on Sunday and I did nothing at all. Don't know where you find the energy! Can I come and eat dinner at your house every night??? So this is what you do when you're tired? Yeeesh. Hate to see what you can accomplish when you're rested. The side yard is looking good! I guess you'll have fun filling the new beds with lots of lovely plants and will enjoy having less lawn to care for. your pie looks amazing. recipe from ??? 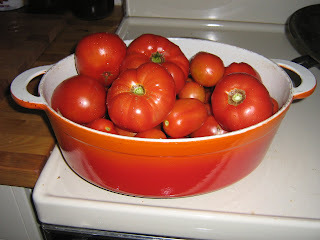 Roast tomatoes. What a concept. I think I'll try that with my next ripe batch. Just stick in oven and roast until soft? Any secrets? Hmmmmmm, one large man? Do you mean one hunk of a man who cleverly laid the path in such a manner that once one or three jars of boozy peaches have been consumed, one will walk the path perfectly? Does Snape have such talent? I'm sure that one large man and his two little men helpers were very grateful to help out with the eating of the pies after a hard days work and were very happy that the 'little woman' had been so busy in the kitchen. 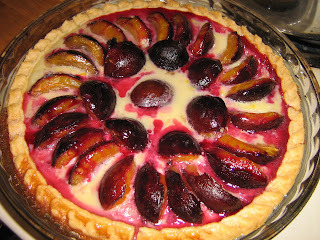 That plum pie looks incredible! Man, you are so productive!! That plum pie makes me hungry. :) Yummy!